Question of the Week: What’s the Difference Between the Marvel Comics App and Marvel Unlimited? You are here: Home / Featured / Question of the Week: What’s the Difference Between the Marvel Comics App and Marvel Unlimited? I spend a lot of time talking about the wonders and tribulations of Marvel Unlimited, but a reader question reminded me this week that Marvel’s app game is potentially confusing. On one hand you have the official Marvel Comics app, and on the other you have Marvel Unlimited. What’s the difference between the two? How do they interact? And how could these two apps synchronize in the future to completely revolutionaize and monopolize the digital comics landscape? What can you read? Digital comics you’ve purchased, either directly through the Marvel Comics app, the Marvel digital store, or Comixology. Reading experience? Very smooth. Utilizes Comixology smart transitions making for a very clean reading experience. Can you read offline? Yes, assuming you’ve downloaded all the books you want on your device prior to going offline. Bonus Perks? You know those redeem codes stuck to the insides of your comics? Well, when you enter them into marvel.com/redeem you’ll get a digital version of your comic. And you can read that digital version in the Marvel Comics app. How often does Comic Book Herald use this app? Once or twice a month likely. Infrequently, depending on digital comic sales or giveaways. What does the app cost? Free. Subscription is $70 annual or $9.99 a month. Reading experience? Improving, but occasionally clunky. A vast majority of the bugs have been improved, but the smart panel reading functionality of Marvel Unlimited is nowhere near as smooth as Comixology or the Marvel Comics app. Text and images still occasionally get cut off in odd places. Can you read offline? Yes, up to 12 issues at a time. Note that this functionality is quirky, and may require the workarounds of a [lunatic] wise comic fan. Bonus Perks? Did you hear the one about nearly every Marvel comic ever published? How often does Comic Book Herald use this app? Hourly. In short, Marvel Unlimited is the app you use with your Marvel Unlimited subscription. It’s fantastic for full size tablets, and still enjoyable for the truly comic obsessed on mini tablets and smartphones (I probably knock out 2-3 comics on my Galaxy S4 every day). Marvel Comics app is the Marvel specific branch of reading digital comics you have purchased. 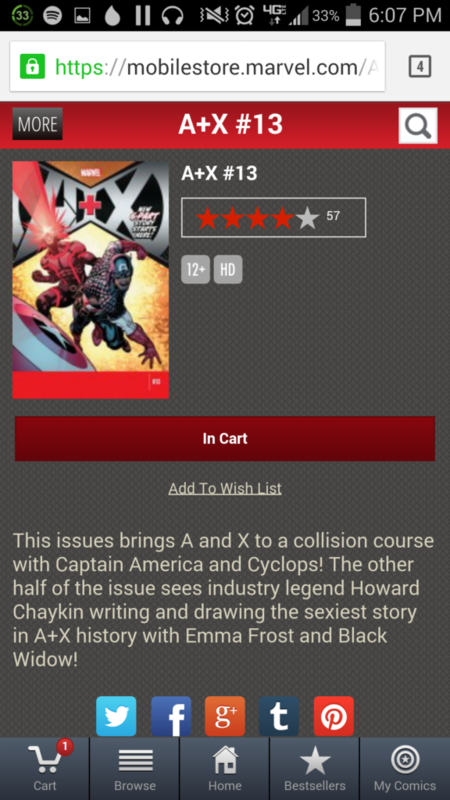 It is essentially Comixology, but just for Marvel Comics. I’ve never had a problem with it, but I don’t frequently have much need to step outside of Comixology or Marvel Unlimited to read books here. I do enjoy the ability to redeem purchased comics (and particularly purchased original graphic novels like The Infinity Revelation), as well as Marvel Infinite Comics. Do the Marvel Comics App and Marvel Unlimited Interact At All? When you select a comic to read in Marvel Unlimited, below the option to read the book you’ll see the option to “Own It” and a price. 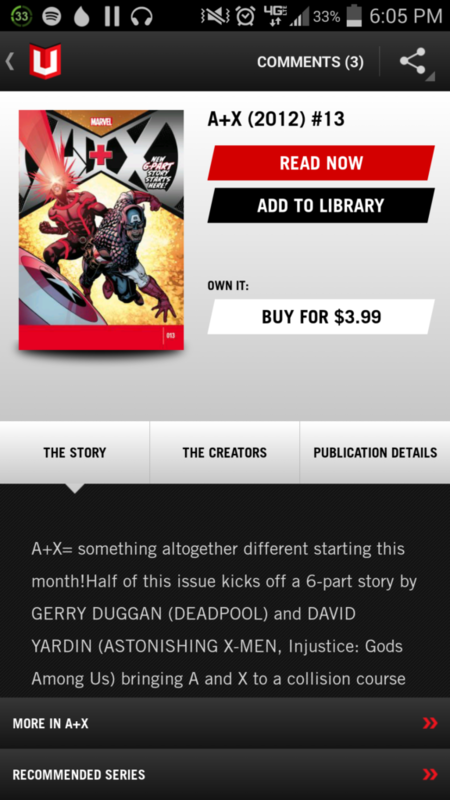 Ignoring for a moment the implication that anyone would want to purchase an issue of A+X for $3.99 when they already have Marvel Unlimited access to that exact issue (I’m not actually going to ignore that… that’s crazy), clicking the “Own It – Buy for $3.99” button will take you to the online Marvel store. Not inside the Marvel Comics app. So the short answer? No. Marvel Unlimited and the Marvel Comics app are not connected. Here’s my scheme for fun and profit that I’ve pitched before: Instead of “Own It” taking you to the same issue you already essentially own in Marvel Unlimited, why wouldn’t Marvel take you to the issues of the ongoing series that are not yet available via Marvel Unlimited? Doesn’t that make infinite more purchase sense? For all its depth, Marvel Unlimited’s biggest drawback for many is a six month delay between publish date and Marvel Unlimited availability. The half year delay makes a lot of sense. There’s no way Marvel could continue to offer a subscription service at $70 a year if they were giving away every ongoing comic they published. Guardians of the Galaxy did well, but come on. That said, if you’re reading Uncanny Avengers on Marvel Unlimited and you hit issue #16 this week, you’ll pprobably want to keep reading issues #17 – #24, the last of which came out last Wednesday. That’s eight issues I’m actually likely to purchase through the Marvel Comics app (although I’m not really sure about the $3.99 price point for digital) if I don’t want to be patient. And guess what? I don’t really want to be patient! Rick Remender’s Uncanny Avengers has really won me over despite a mixed beginning, and I want to see how it leads into Axis, Marvel’s newest event. The digital comics landscape is still relatively young. Through a superior experience, Comixology was able to position themselves as the source for digital comics purchasing and reading. There are minor threats to the throne but none offer the experience Comixology does (not to mention the new Amazon funding). While a disruptive new technology could possibly unseat the king, Comixology got in first, and marketing 101 tells us that you can’t position yourself as just “better but the same” when you’re not first. Marvel is a completely different digital comics beast, though. No other digital comics player has a 33% print comic market share. In fact, no other digital comics player is an actual publisher. The only real reason Marvel has to remain available in the Comixology store and share profits is because it doesn’t yet have a uniformly better experience. Marvel Unlimited doesn’t seem to have the technology. This is where Marvel Unlimited comes into play. Yes it’s a subscription comics library model, and yes that’s an innovative play for a publisher as is (DC Comics has yet to even hint at a similar offering despite undeniable demand). But you know what else Marvel Unlimited has allowed Marvel to do? Experiment and develop digital comic technology so they can ultimately offer a completely self-sustaining Marvel digital experience. It’s easy to poke holes in Marvel Unlimited’s reading tech, but there’s no denying that it has gotten a LOT better, and in three years it’s made the jump from desktop-only to mobile (no small feat with a library of comics that size). If I’m at Comixology I’m anxiously doing everything can to plan for the Doomsday scenario where Marvel finally synchronizes the reading experience of the Marvel Comics app with Marvel Unlimited. So what do you think? Which app do you prefer, or which app do you use more frequently? And as always, if you have a question for Comic Book Herald, you can reach me at dave@comicbookherald.com or @comicbookherald on Twitter. The huge letdown is that unlimited does not accept debit cards and comixology doesn’t like you being out of the USA. Its costing marvel my business with these things as I simply cannot access what I want from Australia. It’s a no-brainer that comiXology has the best app that I’ve found. Not that I’ve really looked all that much as CX hooked me from the beginning. I was surprised when I finally went back to Marvel.com and found out that their store was run by CX. I really don’t want to subscribe to Marvel & – well, the rest. Marvel and CX share the same Marvel sales. (I AM catching up, you understand.) Soooo…I’m with comiXology for the long run, especially since their Amazon association. That’s big bucks to go along with Marvel’s Disney affiliation. Unless they get greedy – which Diz has been known to do – why should they invest in the R&D when they’ve already got it through CX? Not to mention any patent issues there may be. Thanks for making me think. Now it’s time for a nap, I think. Haha yes, it’s an interesting, potentially complex issue. The patent implications with Comixology’s reading tech could be big. Might ultimately be easier for Marvel to just partner than waste the time and effort trying to match their tech, as you said.